First things first, gather your equipment! I like this cream cheese frosting. It’s not super runny like other versions and seems to harden just enough so you can stack cookies without ruining all of your hard work. 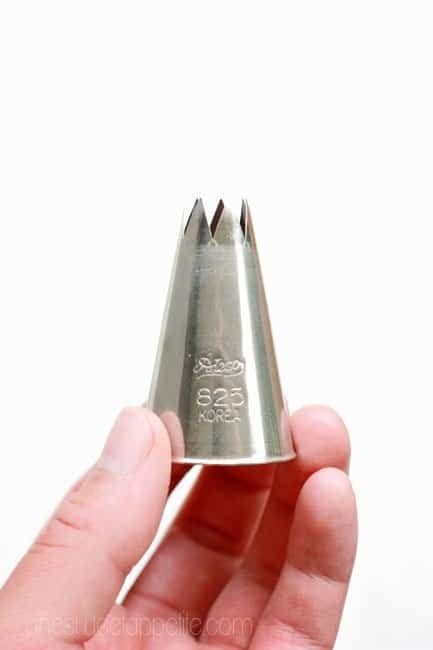 You will also need some decorating bags and a piping tip . Oh, and don’t forget the cookies! 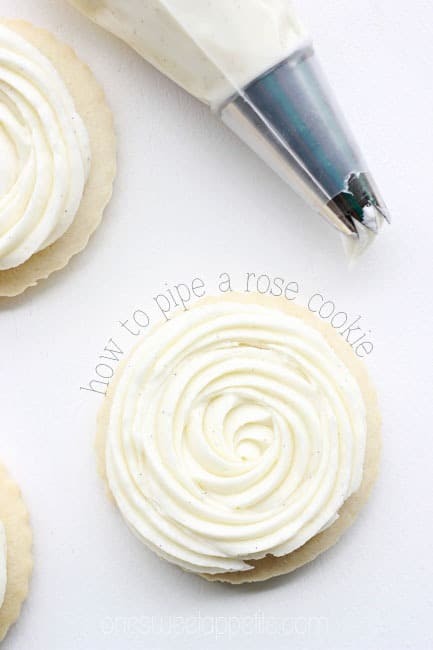 What piping tip should you use to pipe flowers? Normally I use a slightly larger star top but because we moved across the country half of my things are currently unavailable. This Ateco 825 tip makes a pretty rose and is probably my new favorite. TIP: You want to keep your bag at a 90 degree angle. 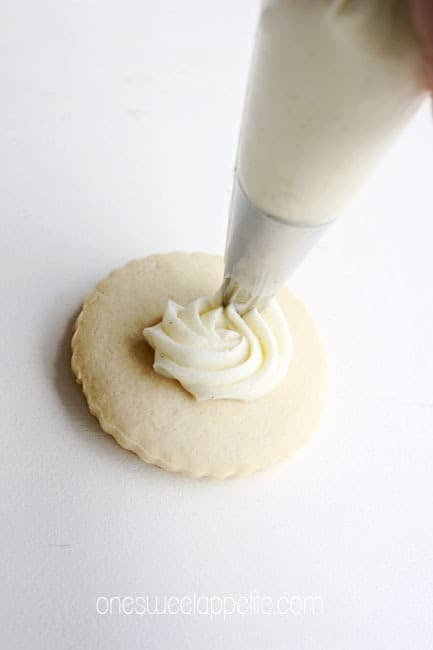 Pipe starting in the center and moving clockwise toward the edge of your cookie. Make sure you keep even pressure on the bag. When you get close to the edge slowly stop applying pressure and pull away. Here is a little step by step in photo form. Really, these rosettes are as simple as pie. 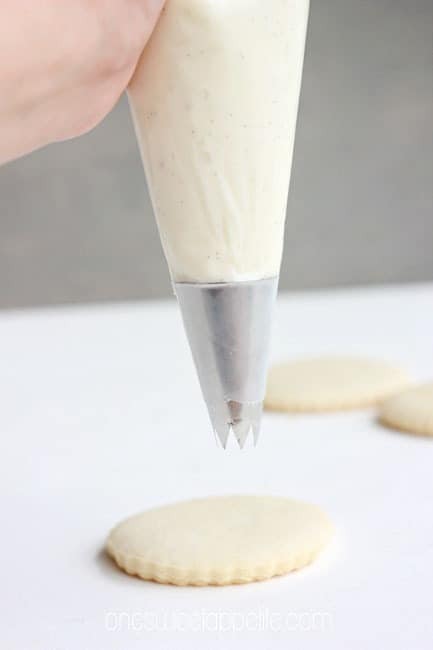 Practice on your first batch of cookies and you’ll be impressing friends and family in no time! So what do you think? Ready to dive right in and try this out for yourself? 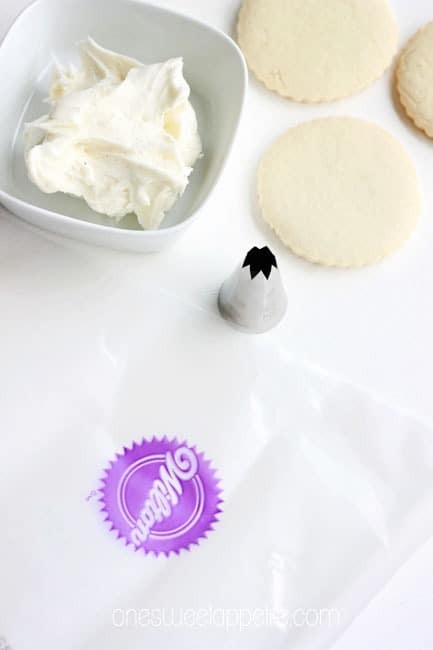 Whip up a batch of these yummy sugar cookies and get practicing! 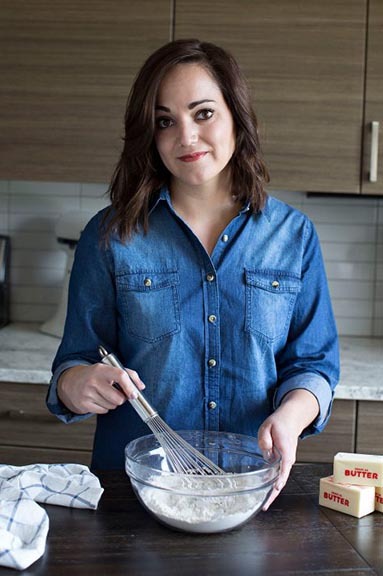 Don’t forget to tag me in your photos so I can see when you try out a recipe or tutorial. They look so delicious and so pretty as well! Thanks for the excellent tutorial! It is so wonderful to see a step by step for us beginners! Beautiful cookie. Thank you! I know that they can be intimidating so a step by step can help people see how easy they really are to make. I will try this, looks so pretty.